Ever have one of those days when you don’t know what to do with the kids and you’re stuck inside with a long, potentially boring afternoon looming in front of you? That was our last Thursday and in a desperate attempt to try to come up with an idea for this week’s SMELL themed SUMMER S.T.E.A.M. Camp activity, I started grabbing everything out of the kitchen cupboards that I could that had a scent! 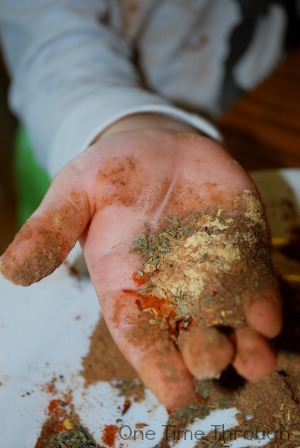 What I ended up with was a pile of spices (plus ground coffee and powdered cocoa) on the counter – and a very interested child. Read on to find out how we spiced up our afternoon with some math and art! 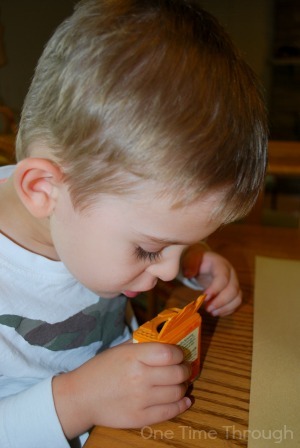 What Onetime (my 3 1/2 year old son) wanted to do at first was just smell everything! ***Now after reading a very sad news article last week about a 4 year old inhaling ground cinnamon and dying from inhaling the substance, I immediately put the cinnamon back in the cupboard. Please do the same. Then I realized that this might be the perfect opportunity to do some sorting – so I grabbed a large piece of paper and a marker and drew a basic Venn diagram (two circles overlapping in the middle). I explained to Onetime that the Venn diagram would help us keep track of the spices that he liked and didn’t like, and the ones he thought were just okay. Then the sniffing began in earnest! I showed Onetime initially how to place the spices on the diagram after his sniff tests, and he picked it up fairly quickly and was able to do this activity pretty much on his own. 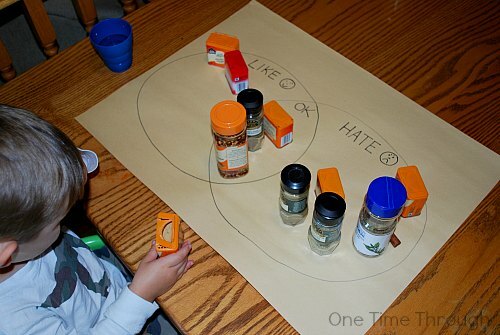 Kids who are 3 to 5 years of age should find this activity fairly easy to do by placing the spice bottles on the diagram. 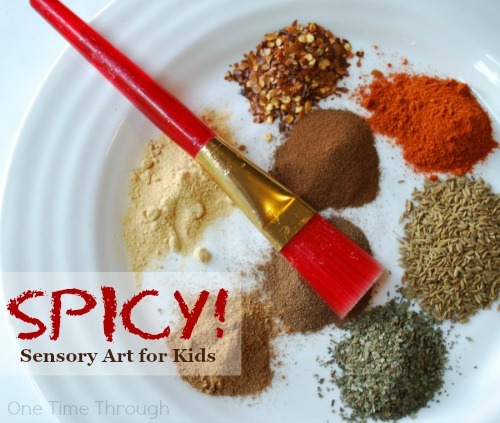 To make it more challenging (and more abstract) for older kids, you could have them place a sticker on the chart (or write the name of the spice) to indicate their decisions. After the sorting was all done, we decided to use Onetime’s favourite spices (and the “okay” ones too) for some process art. 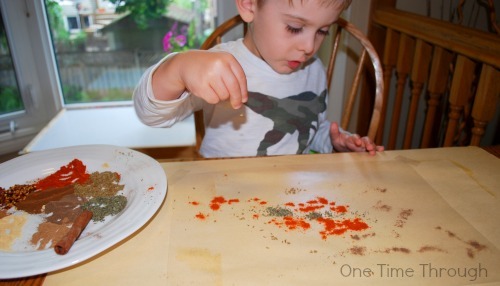 I poured approximately a teaspoon of each of his favourite spices onto a dinner plate, and cut out a large piece of sticky contact paper to be his canvas. I placed the sticky paper face up on top of the flipped over Venn diagram, and I taped it at each corner to keep it flat. Now I’m not going to say it was pretty, but that’s not what process art is all about anyway. It’s about experiencing creativity, enjoying the process, and exploring materials (in this case, with sight, touch and smell!) And this little project had tons of that! 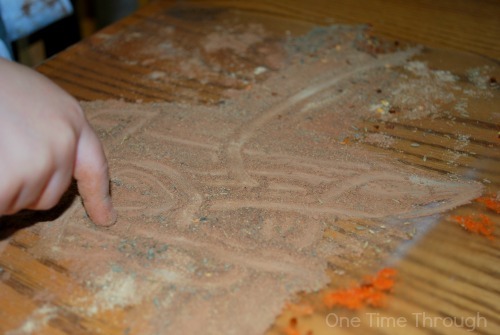 On his second canvas, Onetime even started investigating with drawing in the spices. I wonder where your child might take this idea? Wherever they go, I hope they’ll have a fun and spicy hour or two while enjoying some math and art! 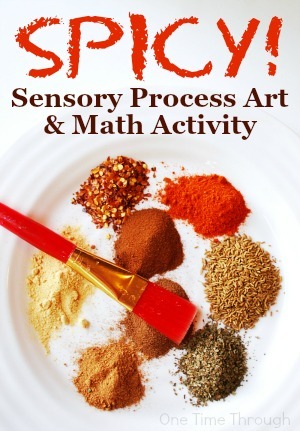 Today’s post was a part of a 5 Senses Science Blog Hop that we’ll be participating in throughout June on Fridays with a bunch of other fun blogs! This week’s theme was science activities that have to do with the sense of SMELL. Check out the other fun posts below! Scented Milk Carton Candles – What Do We Do All Day? Follow One Time Through’s board Open-Ended Art Activities on Pinterest. The looks like so much fun. I can just picture Onetime saying this is going to be the best art EVER! My girl is currently in love with contact paper art projects so we’ll definitely have to try this one. Yes – it was very cute Anne. I had to stifle a laugh! Thanks for dropping by! I love how you and a variety of activities in this project and I love that your son categorized his likes and dislikes! Great ideas! Thanks so much for dropping by Ana! You can use coffee to colour paper. Wet the paper and sprinkle just a little coffee powder at first onto the paper, then maybe more if you want it darker. Using a salt shaker allows you to put it exactly where you want it. Move it around and let it dry. Experiment. If you use Nescafe Vanilla flavoured, the paper will smell like that. Try different papers. Any watercolour papers will not curl as much as lightweight papers. But even then, you could scrunch the paper up and undo it carefully and get a interesting wrinkled paper to draw on. You could also make a solution of concentrated coffee and dip the paper in until you get the shade you wanted. It works great for cotton material too, so you could change white frilly cotton curtains into a light beige colour. Tea will do this colouring too. I haven’t experimented with flavoured teas but it might be worth a try. Ooh! Scented paper! I think I’d really like that – especially the vanilla flavoured one. I thought it was kind of funny that Onetime didn’t like the smell of coffee though when we did our sniff tests. Strange considering I drink it all the time and he must be used to smelling it by now. Thanks so much for dropping by and sharing!